On-the-go stethoscope cleaner! Show your patients you care. Doctors and nurses can quickly and conveniently clean their stethoscopes before and after patient visits. 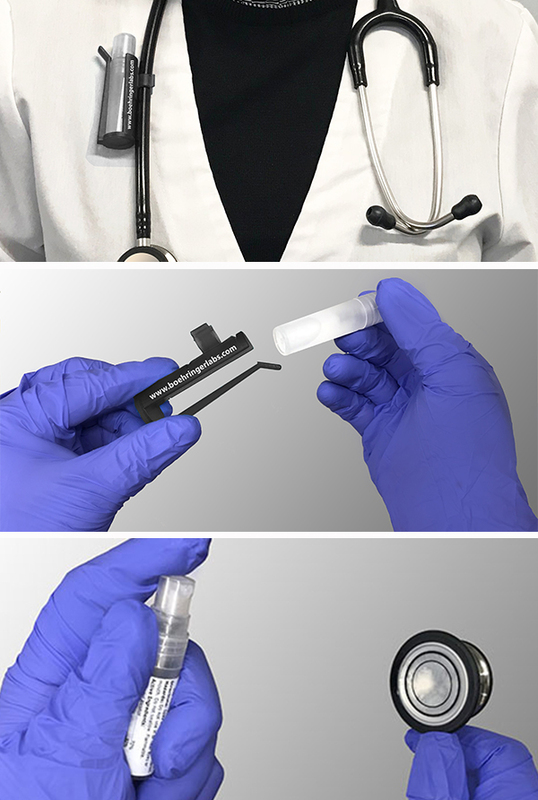 Simply attach the StethoSpray™ clip to the tubing of the stethoscope in the position most comfortable to you. To use, slide the StethoSpray™ bottle from the clip and spray onto the stethoscope diaphragm. After spraying the diaphragm, allow time to air dry or wait at least 10 seconds before wiping. StethoSpray™ is safe for use on touch screens and keypads, however, NEVER spray StethoSpray™ directly on electronic devices as the liquid can damage the product. Instead, use a soft, lint-free cloth and dampen with the StethoSpray™ solution before wiping the screen.